Alissa Braxton has spent her season flying past big numbers. But, this weekend, she cleared her biggest one yet. Braxton, who’s been at or near the top of the nation’s triple jump leaderboard most of the season, hopped her way into the state record book Sunday. 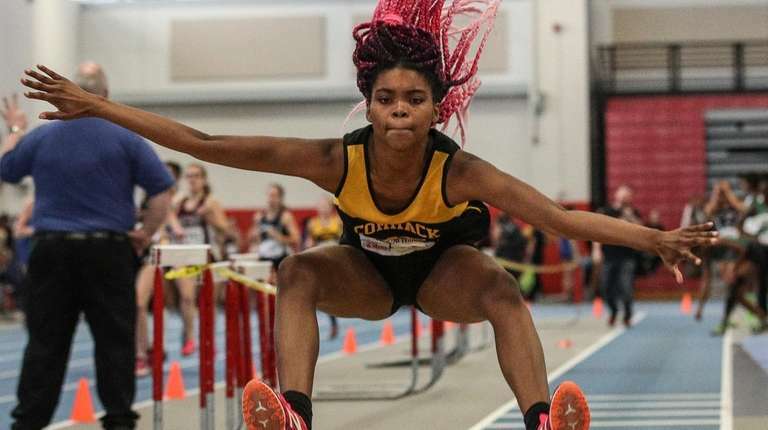 The Commack jumper flew 41 feet, 9 3/4 inches to win at the Ocean Breeze Invitational at Ocean Breeze Athletic Complex in Staten Island, breaking the state record of 41 feet, 8 ½ inches, set by New Rochelle’s Shenae Dawkins in 2001, according to tullyrunners.com. The jump puts Braxton back at the top of the national leaderboard, a place that she occupied for nearly a month earlier this season after hitting 40 feet at a Suffolk crossover meet on Dec. 23. 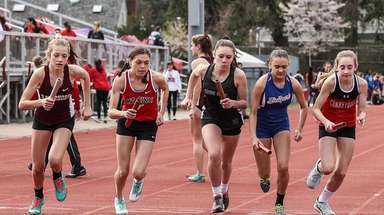 Braxton also hit 40 feet, two inches at the Suffolk League I championships on Jan.20, but said she didn’t see the state record as a possibility. Mainly because she didn’t know what it was. “I didn’t bother to look it up, because I thought it was going to be a 42 or a 43 (feet),” she said. As Braxton lined up for her record-setting jump, she heard a sound she’s always wanted to hear – the power clap from the crowd surrounding the jumping pit. “When you’re about to go, it starts off as a slow clap and when you start running the clap gets faster. 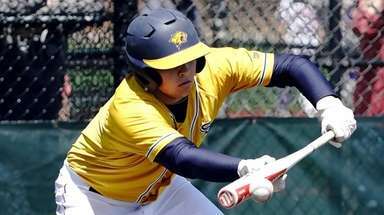 When you jump, it stops and everyone sees what you got,” Braxton said. As the clap got louder, Braxton wanted to make sure she made good use of the fanfare. At first, the adrenaline got to Braxton. 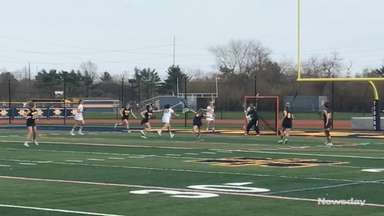 After a shorter-than-optimal opening phase, she adjusted on the fly to set the record. Now, with nearly six weeks left in the season, Braxton finds herself in uncharted waters. She has more than enough time to jump farther and farther into the state record book. 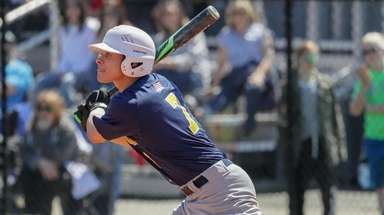 In the short term, Braxton will concentrate on winning a county championship. She’ll compete in the Suffolk Large School Championships, scheduled for Saturday at Suffolk County Community College in Brentwood. Braxton paused for a moment, then let out a laugh.